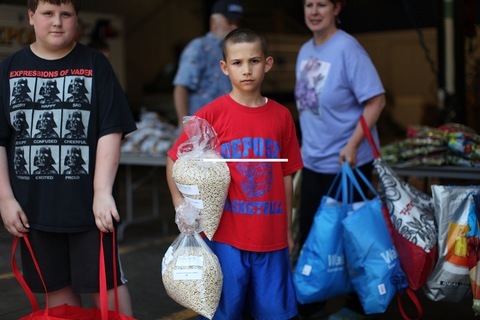 Dominick Aldridga, 8, stands with his family at a mobile food pantry distribution point in Deposit, New York. According to the 2010 Census, 15.72 percent the population serviced by this mobile pantry live at or below the federal poverty level. Photo by Spencer Platt/Getty Images. Editor’s Note | For more on Census’ release, see “More Americans Insured: What’s Behind the Numbers?” on the Rundown. The Census Bureau released its annual report Wednesday morning. Unfortunately, it confirms a trend I’ve been reporting throughout the entire course of my career at the NewsHour, which spans a mere 27 years: economic inequality in the United States, rising inexorably. In the past year and a half, we’ve focused frequently on America’s unequal wealth distribution. The stories we did were among the most-watched in the history of the program. The accompanying chart shows what’s happened to income in the U.S. population, divided by income into five equal parts (“quintiles”). How has the bottom 20 percent fared in the past year? That is, American households making about $20,000 a year or less? They’ve pretty much held steady, earning a paltry 3.4 percent of all income for both 2010 and 2011. Next come Americans whose income falls in the second quintile with a ceiling near $40,000: the bottom 20 percent to 40 percent. Their share of national income dropped by 1.6 percent in a year. Twenty percent of the population, they earned less than ten percent of the income. Next come Americans smack dab in the middle, making somewhere between about $40,000 and $60,000. Their share, down about 2 percent — to less than fifteen percent of 2011 income. Those in the second-to-highest fifth in income, which includes households above $60,000 or so but below $100,000? Down 1.6 percent. though they, at least command income proportionate to their numbers: about a fifth of the population; about a fifth of national income. And finally, we get to the top 20 percent: those households making $100,000 or more. Yes, just as we’ve been chronicling for decades, their share of national income was up again last year: by about the same percentage that the second, third and fourth quintiles fell. They took in about half of all income in the U.S.
As for American households in the top five percent, making more than $186,000 or so, no surprise: their share of income grew robustly: up around 5 percent. So they received more than a fifth of all income, despite the fact that they represent only a twentieth of the population. The bottom line on economic inequality is measured by something called the Gini co-efficient. That rose last year from .456 to .463. There are several lists of Gini co-efficients by country on the web. Using the World Bank’s data, passing .46 would nudge America ahead of such visibly unequal economies as Jamaica, the Philippines and even Rwanda — yes, Rwanda — in our degree of income inequality. Two more charts for you to consider. Here’s median household income, the income of the American family right in the middle: half of all households earn more; half earn less. The chart shows a bumpy ride but significant growth, adjusted for inflation, right through Y2K. That, of course, has been the story of median household income from a lot further back than this chart extends. As long ago as Ben Franklin, the drive to material self-improvement was identified as a key aspect of the American national character. Alexis de Tocqueville observed as much when he visited in the 1830’s. Frederick Jackson Turner made it the basis of his warnings about the closing of the American frontier in the 1890’s. But as you can see, the median American family has lost 10 percent of its income, in real dollar terms, since 2000. I’ve tried to research this and failed, but I suspect there has never been so sustained a period of median household income decline in the history of the republic. Finally, the third chart, mapping the percentage of Americans who fall below the official poverty rate: $23,000 a year in income or less. Note that this threshold is adjusted for inflation. More to the point, note that the number of households in poverty has been shooting up since 2000, just as median household income has been falling. In short, the household in the middle has been getting poorer. And the number of households officially “poor” has grown though mercifully, from 2010 to 2011, it remained flat. Our friend Robert Lerman, an economist at both American University and the Urban Institute, has provided a corrective to some of our inequality reporting in the past, insisting that we include non-obvious sources of wealth like Medicare and Social Security when measuring wealth inequality. Please return here Thursday. I discovered in today’s data what to me, at least, is an astonishing statistic. A tease for those of you my age or near it: the statistic concerns Americans 65 years of age and older. Interactive charts: Credit — Justin Myers. Source — U.S. Census Bureau.